About The Regulatory Group, Inc. Founded in 1980 by Fred J. Emery, the third Director of the Office of the Federal Register (OFR), The Regulatory Group, Inc. (TRG) is a small business consulting firm specializing in the Federal regulatory process. TRG provides consulting and training services in the rulemaking process, regulation writing, policy development, and related report writing. TRG’s staff includes writers, editors, teachers, regulatory analysts, and lawyers, with expertise in all aspects of the Federal regulatory process. TRG's clients include Federal regulatory agencies, as well as private sector organizations that need to understand the regulatory process to serve their clients and constituents. CONSULTING: TRG provides consulting services for Federal regulators to assist with developing, analyzing and drafting regulations and all other forms of policy documents, including directives, orders, instructions, manuals, reports and handbooks. TRG supports agencies in their rulemaking efforts from the early development of concept documents, to advanced notices of proposed rulemakings, to proposed rulemakings, to analyses of public comments, to analyses of regulatory impacts, to issuance of final rules and implementing guidance. Learn more about hiring TRG or send us a message here. TRAINING: TRG offers training courses for anyone involved in the rulemaking process. These courses provide practical, real world explanations of how the regulatory process functions. TRG’s courses are essential (required for many regulatory agency staff) training for agency personnel responsible for drafting, implementing and interpreting rules. 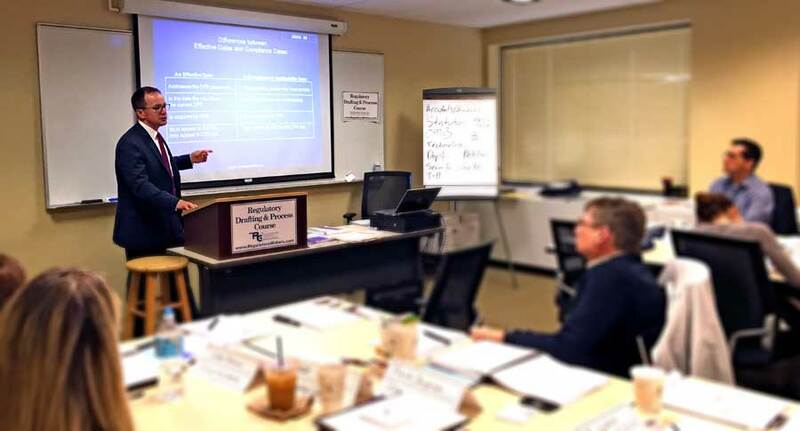 TRG’s courses are invaluable for non-government organization personnel responsible for commenting on proposed rules, interacting with regulatory agency staff, and navigating the regulatory process. Course attendees will learn fundamental aspects of the Administrative Procedures Act requirements for public notice and comment, and the related administrative requirements agencies must comply with, such as the Paperwork Reduction Act, Regulatory Flexibility Act, Unfunded Mandates Reform Act, and all other rulemaking related statutes, Executive Orders and Executive guidance. For example, agency personnel learn the underlying importance of considering and responding to public comments. Private sector personnel learn how to effectively participate in the rulemaking process through development of impactful comments. Training includes instruction in drafting Federal Register publications, including preambles, advance notices of proposed rulemaking, proposed rules, final rules, interim final rules, direct final rules, supplemental proposed rules, agency guidance, and amendatory language. Course attendees include personnel from almost every Federal regulatory agency, as well as personnel from U.S. Congress, State agencies, regulated industries, trade groups, public interest groups, tribal governments, and others seeking to participate in and understand the Federal rulemaking process. Register now or send us a message here.